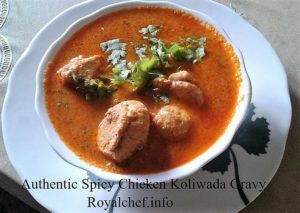 This is a Recipe for making at home spicy and delicious Chicken Koliwada Gravy. 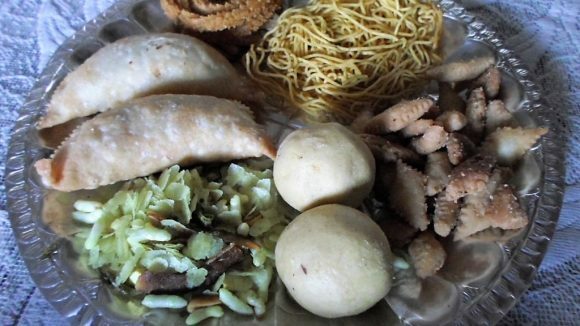 You might have herd about the more famous and popular Koliwada Fish or Prawns Curries, this Chicken Koliwada is also prepared using the same Masala, having the same aroma and flavor. First clean and wash the Chicken pieces and keep them aside. Chop the Onion, Coriander Leaves and keep them aside. Dry roast the Koliwada Masala and then grind in a mixer. Grind the Coconut into a fine paste. Heat the Oil in a Kadai and add the chopped Onion, Ginger Garlic Paste and saute for 2-3 minutes. Then add the Turmeric Powder, Kashmiri Red Chili Powder, Salt and Chicken pieces, mix it well and cover the Kadai with a lid and cook on a slow flame for 5-7 minutes. Remove the lid and add the grounded Koliwada Masala, Garam Masala, grounded Coconut, 2 cups Water and mix it well. Cover the Kadai with a lid and cook for 15 minutes on a slow flame. Serve the Koliwada Chicken Gravy with Paratha or Bhakri.